Everyone can make a difference. Everyone can be kind. And everyone can have creative ideas about acts of kindness during the Festive Season! There are many wonderful and creative lists where you can select acts of kindness that your students can carry out during December. If you are looking for ways to spark some thinking and give the creative muscles a workout, it may be a good idea to simply forget the lists, and instead, think dive into kindness and ways to spread it a bit deeper. I love using questions to inspire thinking. And this method is increasingly becoming more popular. What is kindness? Where in the body do you feel kindness? And how can you describe it? Creating your own words is a great activity and the words can be used to write wonderful personal poems. The poems can be spread around in the neighborhood to spread some kindness. Or. 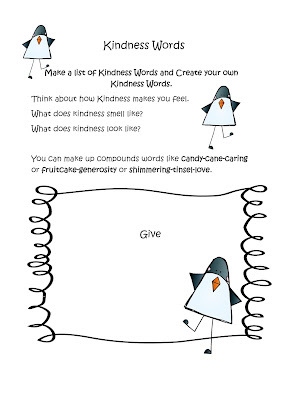 . .
7.Make a list of Kindness Words and Create your own Kindness Words. 8. Where in your body do you feel kindness? 9. How can you Spread Christmas Kindness wherever you go? 10 How can you randomly spread Christmas kindness? 11. Can you write Heart-Shaped Poems? 12. Design a machine that spreads kindness. 13. What if a Christmas kindness machine breaks? How could you repair it? 14. How can you do kind things every day? 15, How can you Dream Big about the Festive Season? 16. How can you spread your Big Dreams about the Festive Season? 20. What if. . .
21, Design a flying machine that can spread Christmas Spirit. 22. 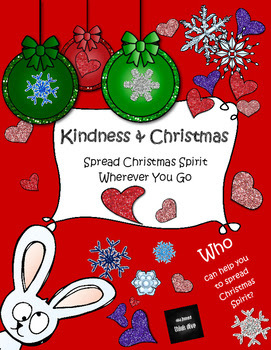 How would you design a Spread Christmas Kindness and Love board game?